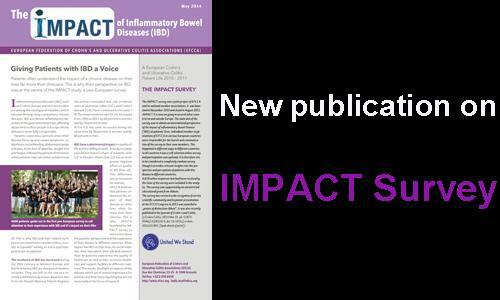 On the occasion of World IBD Day, we are making available our latest publication of the IMPACT survey. The survey was a joint project of EFCCA and its national member associations. It was launched in November 2010 and closed in August 2011. IMPACT II is now on-going in several other countries in and outside Europe. The main aim of the survey was to obtain an international perspective of the impact of Inflammatory Bowel Disease (IBD) on patients’ lives. 4,670 online responses that had been received by the close of the survey were included in the analysis. The survey has received wide recognition from the scientific community and its poster presentation at the ECCO Congress in 2012 was awarded a „poster of distinction ribbon”. It was also recently published in the Journal of Crohn ́s and Colitis. The survey was supported by an unrestricted educational grant from Abbott.